This is a die-cut Esso porcelain sign. 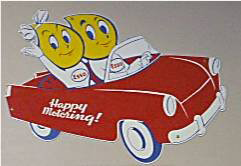 This particular Esso sign features an oil droplet couple driving a red car. It reads, “Happy Motoring!”.